Gold prices may rise another Rs 2,000 for 10 gram to Rs 18,000 during the festive season, according to an assessment made by the Associated Chambers of Commerce and Industry of India (Assocham). The yellow metal is the only commodity which has seen huge build-up in the exchange traded funds (ETF) in the last few weeks. It is likely to gain further momentum in view of the festival demand and low international production once it convincingly stays above the psychological barrier of $1,000 an ounce in global markets. 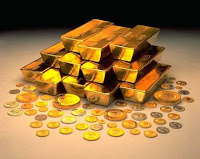 Investors are now used to high prices in gold, the association said. Gold is likely to see a gradual spurt in its prices and rule around Rs 18,000 by Diwali from the current level of around Rs 16,000. This is since more investors are flocking to take refuge in gold as an asset class as it happens to be the best bet against rising inflation. “The high valuations of stocks and the attendant risk have by and large motivated investors to part shift to gold as an investment class,” said the Assocham President, Mr Sajjan Jindal. According to Assocham analysis, stock valuations, which are around at 12-month high, appear to be overstretched and investors are fleeing to precious metal as they are losing confidence in the global economy with equities in Shanghai hitting 3-month low this week. “With exposure in gold-traded exchange funds building up in international markets and touching a record high, investors’ attention in bullion has picked up substantially. National Stock Exchange has reported two-fold jump in its trading volumes in gold ETF counters recently,” Mr Jindal said. In the last six months, gold is the only asset class that has shown resilience and has hardly dropped steeply. It is set to go up in the medium term (six months or so) because investors the world over are losing faith in paper currency. Even though jewellery demand has come down due to high prices, the increased investment demand has more than offset it. The association said any investment in gold should not be at high cost and the best way to buy was to get .999 purity gold bars directly from Singapore or Dubai. In normal times, about five per cent of the investment should be in gold, but during these abnormal times, investment in gold could be 10-15 per cent, it said.